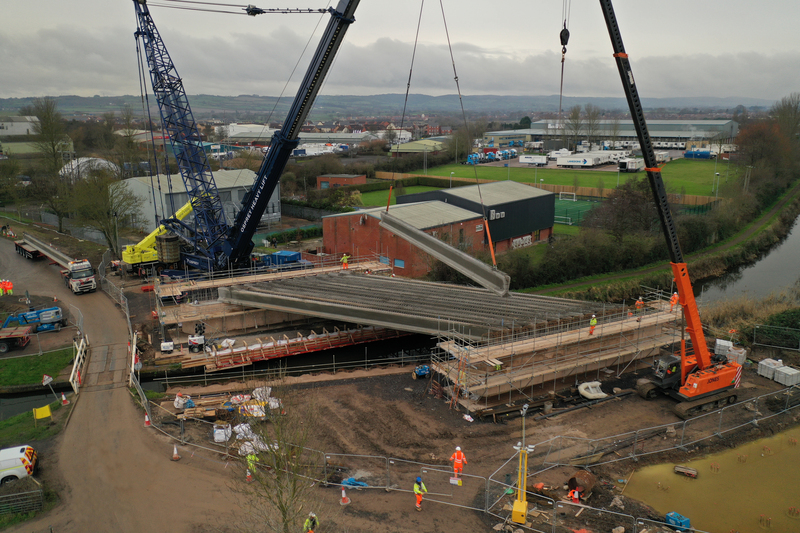 Bridgwater has another new bridge following the installation of a new 30-metre structure over the Bridgwater and Taunton Canal. 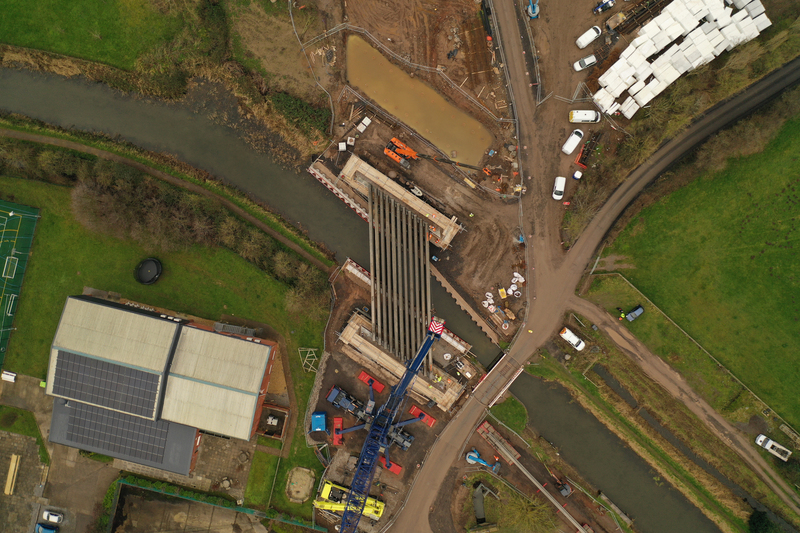 The Crossways Bridge is the latest section of the new Colley Lane Southern Access Road which will link Marsh Lane to Parrett Way and help ease congestion along Taunton Road and Broadway. Somerset County Council’s contractor Whitemountain used an 800-tonne, 44m mobile crane to lift 15 beams into place. Each precast beam measured 30m long by 1.3m high and weighed in at 53 tonnes. Councillor John Woodman, Somerset County Council’s Cabinet Member for Highways, said: “This is the second new bridge for Bridgwater in recent months following the construction of the Somerset Bridge over the River Parrett late last year. “Once again I want to thank everyone at Whitemountain for completing a very complex operation with the minimum of fuss. Gareth McNern, Whitemountain Project Manager, said: “We are delighted to have reached another key milestone with the installation of the Crossways Bridge beams. “The Crossways Bridge is an essential element of the new Colley Lane Southern Access Road. The placement of the beams is a culmination of months of hard work and planning by the Whitemountain site team. The scheme will help ease congestion along Taunton Road and Broadway by connecting Parrett Way to Marsh Lane and providing access to the Colley Lane Industrial Estate from the south. It will also open up brownfield development sites between the River Parrett and the Taunton and Bridgwater Canal. The project is using innovative engineering solutions to overcome some of the challenges on site, such as poor ground conditions between the canal and river. To minimise loading in this area, high density polystyrene blocks have been used as a lightweight alternative to conventional quarry materials. This has an additional benefit by reducing the number of vehicle movements to site by 90 per cent – saving around 500 truck deliveries. The next phase of works involves the construction of the approach roads to the new Crossways Bridge and improvements to the Canal Towpath. To allow this to take place safely it will be necessary to close Marsh Lane Road between the swing bridges at Canalside and the Boat and Anchor pub from Monday 28 January for several months. Access to residents and businesses north of the canal will still be available via the existing swing bridge. Access to the Boat and Anchor will now be via Huntworth as per the signed diversion route. diversion route. Stay up to date with the latest progress reports and photographs at www.clsar.co.uk or follow @TravelSomerset on Twitter for scheme updates. The £18.4m Colley Lane scheme is funded by EDF S106 contributions, housing developer S106 contributions, the DfT Productivity Investment Fund and Somerset County Council’s capital programme.